Composed by Greg Fishman. Play-Along (Book+CD). 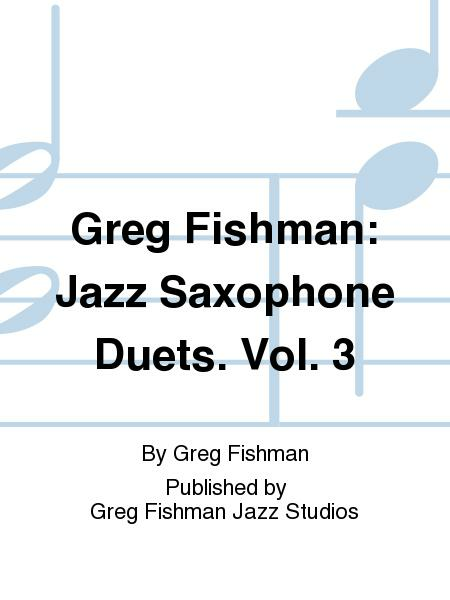 Published by Greg Fishman Jazz Studios (GF.JSD3). This book features ten duets for two altos, two tenors or alto & tenor saxophone. Like all of Greg's books, the rhythm section plays all of the pieces in two different keys, allowing both alto and tenor players to read the same written part. This unique feature ensures that the parts lay perfectly on all saxophones. In addition, the second half of the book features the duets arranged for alto and tenor, making this one of the most flexible duet books on the market. 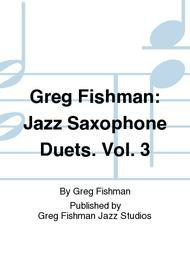 Jazz Saxophone Duets includes 10 Duets and 3 CDs--Versions for 2 altos, 2 tenors and a version for alto & Tenor, with each etude played by Greg Fishman and Mark Colby (2nd tenor), plus extra rhythm section tracks for extended blowing. Also includes: style and analysis section and detailed practice guide for intermediate, advanced and pro-level players.